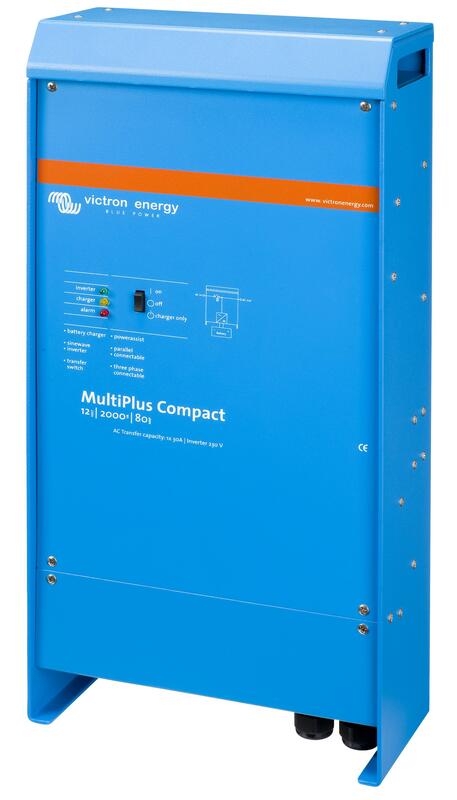 Victron MultiPlus inverter-chargers are one of the most popular power solutions on the market, especially popular for boat and remote power backup applications. The MultiPlus C inverter-charger 800VA version combines a powerful true sine-wave inverter and advanced adaptive charger with a a high-speed AC transfer switch (12-millisecond changeover time). Systems grow and change over time, so it is possible to connect up to 6 MultiPlus units together in parallel to achieve a higher output, for example six 800W units can be linked to produce a 4.8kW system with six times the charging capacity. In addition, the MultiPlus can be used in ‘three-phase’ systems, where three units are used (one for each phase). This means that up to six sets of three inverter-chargers (18 in total) can be connected in parallel, producing 18 times the power output in 3-phases! Under certain circumstances, e.g. charging a completely flat battery bank, the MultiPlus can draw very large AC currents. When connected to a limited power shore-line or to a generator, the AC current can be limited to avoid overloading the generator or tripping the shore supply. The MultiPlus will also take the requirements of other AC loads into account, only using what is left to charge the batteries. All MultiPlus inverter-chargers of 3000W or greater now include two AC outputs. One of the outputs (AC1) is 'always on', meaning that appliances connected to it will always have AC power. The second output, however, is only active when the MultiPlus is connected to an AC supply (generators, shore-lines, etc), but will be switched off when only a DC supply from the battery banks is available. This configuration is ideal for when you have high current consumers, such as an immersion heater, that you would not want to power from your batteries, or where you wish to have only auxillary lighting when the mains grid fails. (All Quattro inverter-chargers include this feature). Where the AC currents are limited by the capacity of the generator or shore-line, PowerAssist makes it possible to exceed the current limit by temporarily combining DC power from the battery bank. When the excessive load drops, the MultiPlus reverts back to using AC power again, using any surplus capacity to recharge the batteries. When in UPS mode, the MultiPlus switches from AC to DC input power (in the event of a power failure, for example) in only 12-milliseconds. During this time, the voltage output only falls to 180VAC very briefly, allowing sensitive computer and communications equipment to continue operating. In certain circumstances, such as when using an old or unreliable generator, or in countries with unpredictable mains power, it may be necessary to activate the ‘weak AC’ option. When activated, the MultiPlus will operate with a much wider AC frequency and voltage range, although some efficiency is lost as a result. This is invaluable, especially in some of the Third World nations, where Victron equipment is often used for remote power supplies. The main output charges the DC battery bank using advanced ‘adaptive charge’ software. The software fine-tunes the charge cycles to match the condition of the batteries, with a fourth stage for long periods of float charging. In addition to this, the 12V and 24V MultiPlus inverter-chargers have a supplementary trickle charge output which can be used to maintain the starter battery. Nine times out of ten, it is not necessary to change any of the settings of the MultiPlus inverter-chargers, but if you wish to do so, this can be done very quickly using the new DIP switches, or by connecting the MultiPlus to your laptop and using the free VE.Configure software (available from the Victron website). Auxiliary output n. a. n. a. n. a. General purpose com. port n. a. n. a. n. a.